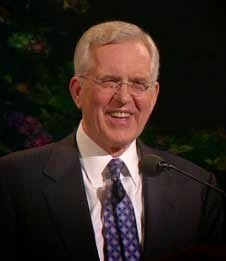 Elder D. Todd Christofferson (1945- ) was called to the Seventy in 1993, and as a member of the Quorum of Twelve Apostles in 2008. "We need strong Christians who can persevere against hardship, who can sustain hope through tragedy, who can lift others by their example and their compassion, and who can consistently overcome temptations. We need strong Christians who can make important things happen by their faith and who can defend the truth of Jesus Christ against moral relativism and militant atheism. "Divine covenants make strong Christians. I urge each one to qualify for and receive all the priesthood ordinances you can and then faithfully keep the promises you have made by covenant. In times of distress, let your covenants be paramount and let your obedience be exact. Then you can ask in faith, nothing wavering, according to your need, and God will answer. He will sustain you as you work and watch. In His own time and way He will stretch forth his hand to you, saying, 'Here am I.'" That's a great list to ponder in self-introspection. How am I doing? What areas should I work on strengthening?